Bologna saw 1,000 people marching on February 1st, to bring the claims of Granarolo workers to the attention of local and national authorities. There were logistics workers not only from Granarolo’s own warehouse but also from other warehouses across Northern Italy, where strikes and protests have been taking place almost every day for months. Marching with them were social center activists, radical political organizations and ordinary people who wanted to show their solidarity with the protesting workers who are often treated very badly by the police. Granarolo, the dairy product giant, is a company owned by a cooperative, Consorzio Granlatte. Consorzio Granlatte is a member of Legacoop, an association bringing together some 15,000 cooperatives, which protects the interests of the big groups like Granarolo and is also the economic arm of the Democratic Party. The system of cooperatives is a distinctive feature of the Northern Italy economy, especially in Emilia Romagna. Just after World War II, the Italian Communist Party saw cooperatives as a compromise between the socialist and capitalist economies and so, in those regions where it held power in local government, it developed a particular system. This system immediately began to act as a channel to spread economic influence and feed political alliances and it has continued to prosper through all the different transformations of the old Italian Communist Party to the Democratic Party of today. The huge Italian cooperatives, like Granarolo or Coop, have nothing in common with the aim of the original cooperative model, even though they market themselves as good and different. They are one of the strongest economic powers in Italy, employing around 500,000 people, and exploiting even more by a complex system of subcontracts. Granarolo’s logistics workers are asking for the reinstatement of 51 colleagues (fired after the protest started to build in the warehouse), better salaries and the end of the Bossi-Fini law which so effectively encourages blackmail. They are organized by the SI COBAS union and have the solidarity of another base union, the USB. 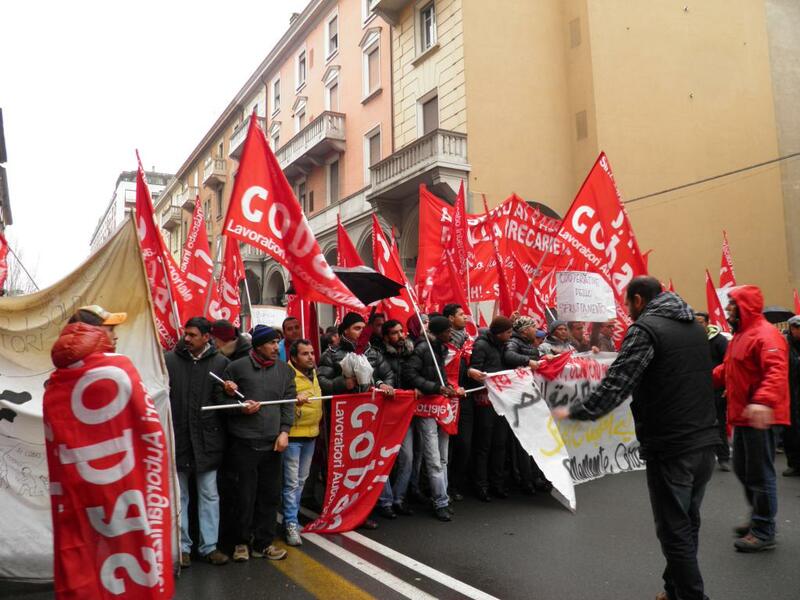 The CGIL union, on the other hand, is accused by the workers of colluding with Granarolo and Legacoop. Actually, as CGIL is politically close to the Democratic Party, it has preferred to ignore workers’ claims rather than to annoy the big cooperatives. More information and related articles are here. Logistics workers' struggle described "as worrying as mafia-related events"